For those of you who know me well, you realize that out of the many things I am passionate about, three of these are toward the top of my list: Disney, dogs, and superheroes. When these are blended, Bolt from 2008 appears. You would think I would pretty much be won over. However, there were many aspects I did not care for about this film. Although it was quite endearing and lovable, it left me somewhat empty inside. Bolt is the story of a canine actor. He always plays a dog in films with mighty powers, and does not want to believe that he is actually an ordinary pooch who does not have any powers to begin with. The storyline is fantastic. The directors, Byron Howard and Chris Williams, orchestrated this film very well. Howard also directed one of my personal favorite Disney films, Tangled. Williams worked as a writer for Mulan and Brother Bear among others. Quite the variety of actors assisted in voicing the characters for this film. 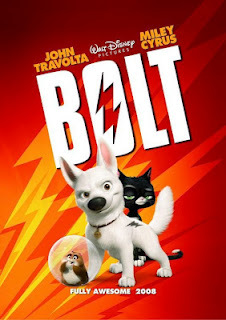 John Travolta voiced Bolt himself, while Miley Cyrus voiced Penny, Bolt’s fellow actor/human owner (and later to be actual owner). Malcolm McDowell voiced the evil Dr. Calico while the great Mark Walton helped out for Rhino, the adorable hamster. Although these may sound like awesome names to many of you, I did not hear a large amount of dedication and drive through the characters. Cyrus and Essman (who portrayed Mittens) left me simply picturing the human instead of molding them together to become the actual character. That brought me right out of the entire plot. Here is my issue with the film. It is an absolutely personal issue, so you should probably not let this affect your decision as to whether or not you watch this. But I have to share my thoughts. The first scene opens to an animal shelter, where Bolt sits as a puppy with a toy carrot in his mouth, and he endearingly looks upside down at Penny, who is coming in his direction. Believe it or not, this is the first scene I cried at. Why, you may ask? Because my dog, Daisie, was also a lovable, stark white puppy who looked at me adoringly when I saw her for the first time. It brought back a flood of memories, and to look at her at the ripe age of 11 years old made me realize how fast time is going by. It is a very bittersweet feeling. I am excited to see what lies ahead in life, but I never want to lose Daisie. That being said, I cried just as hard at the very last scene, where the dog is seen again in his older years, with the same toy, looking at Penny with the same lovable eyes which stared at her years before. Anyone who has a pet or has had one in the past will absolutely connect with these scenes and remember how they felt during those important moments in life. It is very rare for me to choose the main star as a favorite character. However, this is the case. I love Bolt, who he is, and everything he stands for. He wants to be more than what he really is, and that actually represents every single person in this world. We all want to do more than we can, and that is not easy in the least. My favorite scene is very brief, but it takes place toward the beginning, inside of Bolt’s trailer when Penny is trying to get Bolt to play with her. She rolls a ball toward him, and although he is looking straight ahead, his eyes glance at the ball rolling past him, but he continues to stare ahead. I laughed out loud, as this once again reminds me of my own diva dog who will only play when she is good and ready to. The majority of the scenes are absolutely captivating and I do not want to steer anyone away from seeing this. Please see Bolt. I ask this of you. The road trip which Bolt, Mittens, and Rhino go on is so sweet and as I mentioned previously, the storyline is great. Bolt is completely worth it, and makes you realize just how important our pets are to us and how they are family. Because the film affected me heavily the way it did, I will most likely not be interested in re-watching it again, at least anytime soon. But I do encourage you to check this film out, especially if you want to see one which lovingly tugs at your heartstrings, which we all know is what Disney does best. I’m going to beat your pancreas with your spleen!